Sarah Boyer - that's me! - is a Professor of Biology at Macalester College and the PI of the lab. You can find my CV here, and my ResearchGate profile is here. Kata Hahn '20 is working on systematics and biogeography of mite harvestmen from New Zealand. Rina Morisawa '20 (below, third from right) is describing new species of mite harvestmen from the North Island of New Zealand. Eliza Pessereau '19 (below, second from left) is working on describing new species of mite harvestmen from the South Island of New Zealand. After graduation she will (pending clearance!) be headed to Cameroon as a member of the Peace Corps. Pietro Tardelli Canedo '19 (honors) (below, second from right) is studying phylogeography of a widespread mite harvestman species from the South Island of New Zealand. After graduation he will be working as a technician in the Laboratories of Analytical Biology at the Smithsonian National Museum of Natural History. Rainah Ward '19 is working on systematics and biogeography of mite harvestmen from New Zealand. Raine Ikagawa ’17 (honors) (below, right of Sarah) studied reproductive behavior with our collaborator Kasey Fowler-Finn (St Louis University), as well as microhabitat use of Minnesota’s daddy long-legs. She is applying for grad school in evolutionary biology. 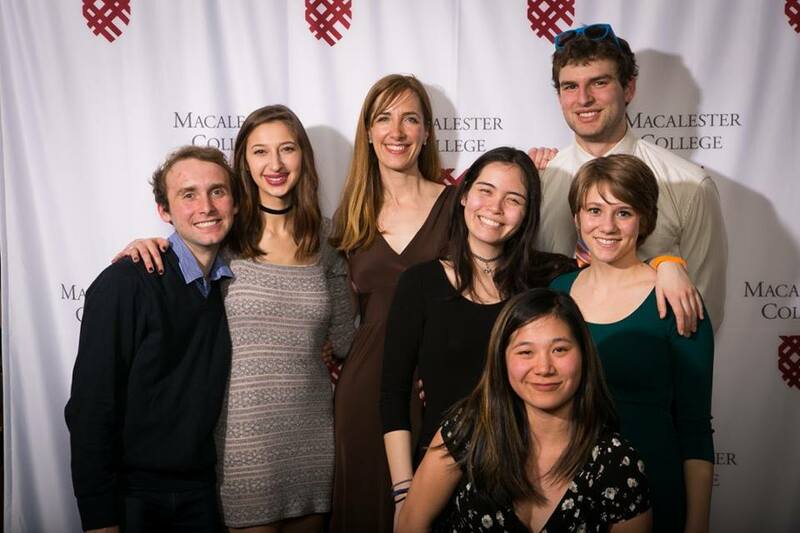 Penny Kahn ’17 (honors) (below, far right) worked on harvestman chemical ecology in collaboration with Macalester chemist Dennis Cao and Mercedes Burns, a Macalester alum. She has also worked on reproductive behavior and microhabitat use of Minnesota’s daddy long-legs. She is currently working in the Ratcliff Lab and applying for grad school in evolution biology. Dan Klonowski '17 (below, back row on right) worked on paleodistribution modeling of mite harvestmen from the Pacific Northwest and is training to become a high school teacher in Dallas, Texas. Eva Larsen ’17 (below, second from left) studied reproductive behavior with our collaborator Kasey Fowler-Finn, as well as microhabitat use of Minnesota’s daddy long-legs. Eva is now an intern at the American Museum of Natural History. Alex Lewanski '17 (below, far left) worked on phylogeny and biogeography of mite harvestmen from the Pacific Northwest. After graduation he worked as a field technician, studying bird behavior. He is currently pursuing a PhD in evolutionary biology in the Wagner Lab at the University of Wyoming. Maddy Olson '17 (below, down in front) worked on diversity of harvestmen from Minnesota and latitudinal clines in species size. ​Michelle Coblens ’16 (below, far left) studied the diversity and evolution Queensland’s mite harvestmen and as well as sexual selection in Minnesota daddy long-legs. She is currently interviewing for med school. Mito Imagawa ’16 (below, middle) identified new species of armored harvestmen from Queensland and will begin work on a master's in Environmental Chemistry at the University of Minnesota this fall. Katya Jay ’16 (below, 4th from right) studied the diversity and evolution Queensland’s mite harvestmen and is a PhD student in Integrative Biology at Oregon State University in Sally Hacker's Lab. Joanne Johnson ’16 (honors) (below, far right) studied the diversity and evolution Queensland’s armored harvestmen. She currently works at the Washburn Center for Children, a non-profit mental health clinic. Kaelyn Lemon ’16 (below, left of Sarah) worked on molecular phylogeny and dating of Queensland’s mite harvestmen. She currently works for the Public Library of Science (PLoS) publishing group in San Francisco. 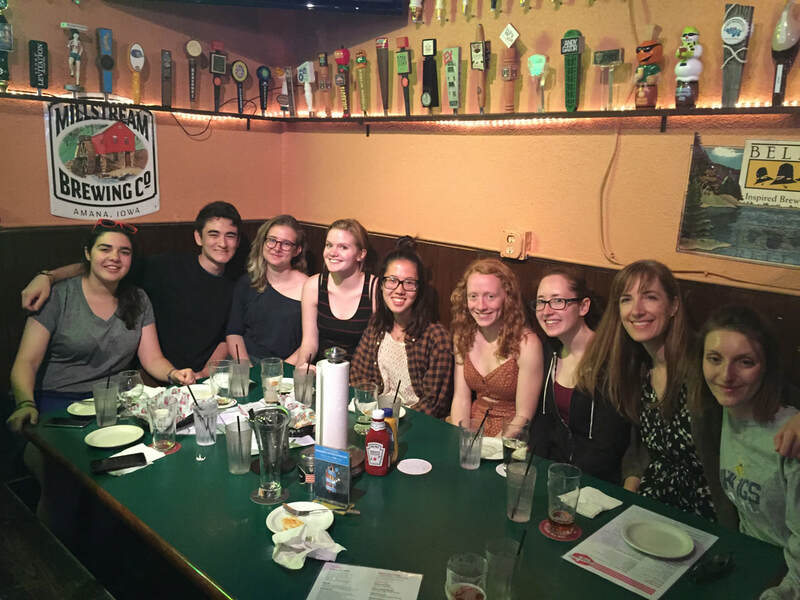 Jill Oberski ’16 (below, 4th from left) studied the diversity and evolution of Queensland’s mite harvestmen and worked for a year after graduation as a tech in the Sharma Lab in U Wisconsin - Madison's Zoology Department. Jill is a PhD student in Entomology and Nematology at UC-Davis where she is focusing on ant evolution in Phil Ward's lab. You can find more on her research here. Kenji Shoemaker ’16 (below, 2nd from left) worked on diversity and reproductive behavior of Minnesota’s daddy long-legs. After graduation he worked as a tech in the Sharma Lab in U Wisconsin - Madison’s Zoology Department for a summer, and is currently working in theatre in the Twin Cities. Mo Usavage ’16 (below, 3rd from left) worked on the relationship between genetic diversity and habitat history in Queensland’s mite harvestmen. ​Charlie Benck ’15 worked on DNA barcoding of zooplankton from the St. Croix River, in collaboration with the National Park Service. Amanda Wareham ’15 worked on DNA barcoding of zooplankton from the St. Croix River, in collaboration with the National Park Service. Sarah Couser ’14 worked on DNA barcoding of zooplankton from the St. Croix River, in collaboration with the National Park Service. She went on to earn an MD from Tufts University. Domokos Laukó ’14 worked on the effect of invasive buckthorn on leaf litter arthropods, and also on the diversity and evolution of mite harvestmen from Queensland, Australia. He is currently at PhD student in Plant and Molecular Biology at UC Berkeley, working in the Welch Lab. Rachel Quay ’14 worked on taxonomy of mite harvestmen from Australia’s Wet Tropics and now works for College Possible. Margot White ’14 worked on DNA barcoding of freshwater mussels. She is currently pursuing a PhD in chemical oceanography from the Scripps Institute. Hannah Wiesner ’14 worked on the diversity and evolution of mite harvestmen from Queensland, Australia and went on to work as an outdoor educator in northern California. Zach Popkin-Hall ’13 (honors) studied the diversity and evolution of mite harvestmen from Queensland, Australia. He is currently pursuing a PhD in entomology from Texas A&M University in Michel Slotman’s lab. You can find more on Zach's research here. Forest Schenk ’13 worked on population genetics of freshwater mussels using microsattelites. He is currently hard at work on his PhD in marine ecology at Northeastern University in the Hughes Lab. Venetia (Matt) Vance ’13 worked on species delimitation of mite harvestmen from Queensland, Australia. Caitlin Baker ’12 (honors) studied the diversity, evolution, and biogeography of mite harvestmen from Australia’s Wet Tropics. After graduation she worked as a technician in the Laboratories of Analytical Biology at the Smithsonian Museum of Natural History, and now she is a PhD candidate in Organismic and Evolutionary Biology in the Giribet Lab at Harvard University. Meghan Davies ’12 worked on DNA barcoding of juvenile freshwater mussels. She is now an education specialist at the Norman Bird Sanctuary in Rhode Island. Sam DelSerra '12 explored methods for identifying juvenile freshwater mussels using SEM. She went on to earn a master's in Ecology and Evolution at Stony Brook University and now works for the Humane Society. Joel Soma ’12 explored the utility of nuclear ITS for DNA barcoding of juvenile mussels. He went on to earn his MD at University of Minnesota - Duluth. Whitney Watson ’12 identified new mite harvestmen species from the northernmost reaches of Australia’s Wet Tropics. She spent many years working as a season field tech in the Pacific Northwest and will start work on her master's degree in Wildlife Ecology at the University of Wisconsin - Madison in the fall. Jordan Eckstein ’11 used DNA barcoding to Identify juvenile mussels recovered from naturally-infested fishes from Grand Sable Island (MI), in collaboration with the National Park Service. She is currently an admissions counsellor for Sea Education Association. Nate Juergens ’11 worked on DNA barcoding of juvenile mussels from the St. Croix River, and finished his MD at the University of Minnesota. Jessica Ramirez ’11 explored scanning electron microscopy as a tool for identifying juvenile mussels. She went on to earn her master’s in physical therapy from the University of Central Florida. Catherine Reuter ’10 collaborated on descriptions of new species of mite harvestmen from Queensland’s Wet Tropics and went on to earn a master’s degree in aquatic ecology at Louisiana State University and work in outdoor environmental education. Scott Petesch ’10 worked on genetic diversity of mite harvestmen and went on to earn his VMD at the University of Pennsylvania. Sam Wershow ’10 studied the effect of invasive buckthorn on leaf litter invertebrate diversity, and earned his MS in Biology at U of Western Washington, working on species distribution modeling of alpine plants. He is currently a lecturer at Everett Community College. Alex Howe ’09 helped to develop our approach to DNA barcoding of mussels from the St. Croix River. He is working on his PhD in ecology at Utah State, studying restoration of aspen. Emily Lauer (formerly Sabo) ’09 studied genetic diversity of mite harvestmen, and went on to complete an MA in genetic counseling from UW-Madison. Suzy Szumowski’ 09 (honors) studied mussel population genetics as an undergraduate, and went on to earn a PhD in Cellular and Developmental Biology at UCSD. She now works in the Japanese biotech industry. Jessica Baker ’06 (Harvard University) collaborated with me on a population genetic study of New Zealand mite harvestmen when I was a PhD student in the Giribet Lab at Harvard. Jess obtained her MD from NYU and is a faculty member in the Department of Neurology at UW-Madison. Prashant Sharma ’06 (Harvard University) got his start as my research assistant when I was a PhD student in the Giribet Lab at Harvard, taking hundreds of scanning electron micrographs of New Zealand mite harvestman anatomy. His undergraduate research focused on mite harvestman biogeography and evolutionary relationships, including fieldwork in Sri Lanka with me and Gonzalo. He went on to obtain his PhD from Harvard in Organismic and Evolutionary Biology, and is now a faculty member in the Department of Integrative Biology at UW-Madison.